Objects from puppet theater | That Belongs in a Museum! I brought four objects that could belong in the Museum of Broadcast Communications in Chicago because they are from a collection part of which was actually donated to that museum this past October. 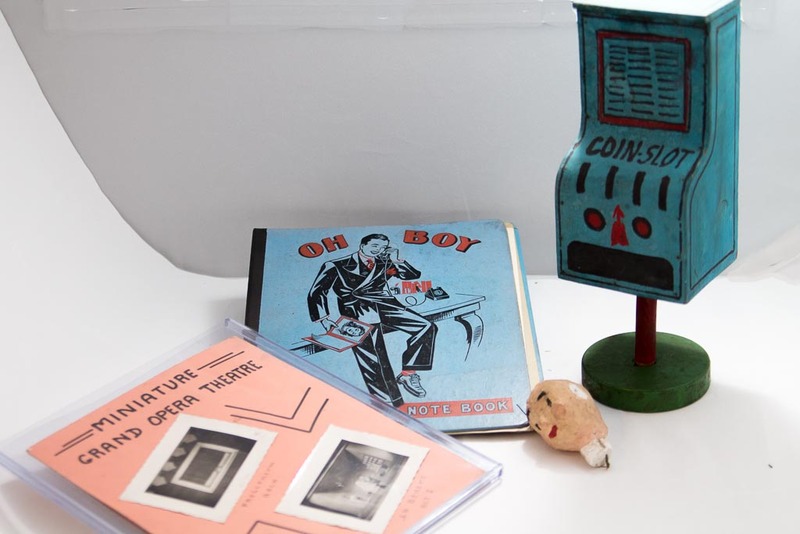 These are from the estate of Warren Best who was a puppeteer in Chicago children’s theater and television beginning in the 1940s through the 1960s. He’s known for creating the character of Uncle Mistletoe who was a holiday character that appeared in Marshall Field’s windows downtown on State Street. And Field’s wanted to have a holiday character to compete with Montgomery Ward’s character, Rudolph the Red Nosed Reindeer, and Uncle Mistletoe was never quite as popular but he did have a television show that lasted about four seasons, and everything from that show was donated to the Museum [of Broadcast Communications]. As far as other things that he had there [at the estate sale]…this is a little puppet head that I found…[Best] made all his puppets by hand, hand painted. This one is plaster. This is a prop from one of his shows…it’s some sort of coin operated thingamajig. This is kind of a display that [Best] had made where he talks about the Grand Opera Theater; he wanted to do miniature puppet operas and…it really shows his vision of wanting to bring puppet work into something a lot more complex than just children’s programs. These were buried in the attic of the estate sale. This is one of Warren Best’s high school notebooks. It’s a science book apparently…in here there are two pages of a script that he was writing for one of his puppet shows. There was one more thing that I couldn’t get; in the attic I found two teleplays from his shows and when I went to pay for them the man at the estate sale told me that they couldn’t sell those to me because they…were to be donated to the museum [of Broadcast Communications]…So that was one time that somebody actually said to me, “that belongs in a museum!” and I had to agree with them.